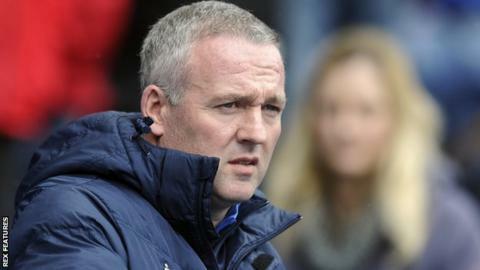 Blackburn Rovers manager Paul Lambert wants a meeting with the club's owners before deciding his future after problems on and off the field. The 46-year-old Scot was appointed in November, but the team have won just 10 of his 27 games in charge and are 16th in the Championship table. "I can't keep being a spokesman for the football club," he told BBC Radio Lancashire. "I went through the same at Aston Villa and I'll never go through that again." He added: "We need to wait and see what is going to happen. Once I've had talks with the owners, there's not much more I can say. It's the same as I've been saying for the last few months." After replacing former manager Gary Bowyer, Lambert steered the club to a season-high position of 11th in the Championship table in December. But they have won just one of their last five league matches, losing the other four including Tuesday night's 2-1 defeat by Sheffield Wednesday. Last month the club revealed that debts have risen past £100m and with the club's owners Venky's based in India, Lambert stated that a "figurehead" was needed to pull the strings off the pitch. Blackburn are the sixth club he has managed, following spells at Livingston, Wycombe, Colchester, Norwich and Aston Villa. "Nobody can take anything away from the owners for putting the money in that they did in the past. I am not here for the past and the club has to move forward," Lambert added. "I've got to be true to my staff, the supporters and the football club. There are great people here and I've always said it needs everyone to swing in the same direction."